GA10 A great little amp for beginners, the GA10 delivers 10 watts RMS output – which is plenty if you’re just starting out and you don’t need the neighbours to hear. Turn up the gain controls for a dirty, distorted sound, or plug in your headphones for a private practice session. Gain control so you can choose the level of distortion. 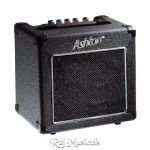 RAJ MUSICALS IS AN AUTHORIZED DEALER OF ASHTON PRODUCTS.